After a couple hours of stargazing one final meteor streaks across the sky just before the sun rises & the crew calls it a night (or day) after one hell of a long drive. 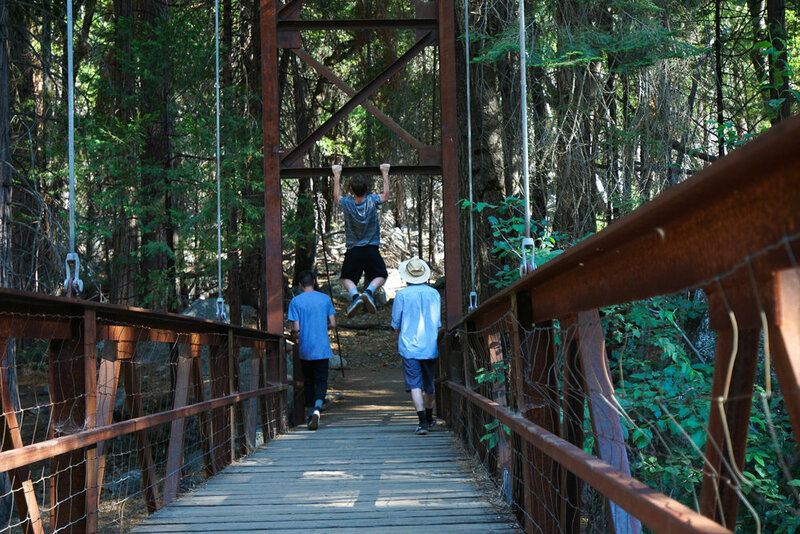 Rested & recovered we scurry off through emerald ferns & towering sequoias on our stroll to the river for a swim as the day quickly heats up. 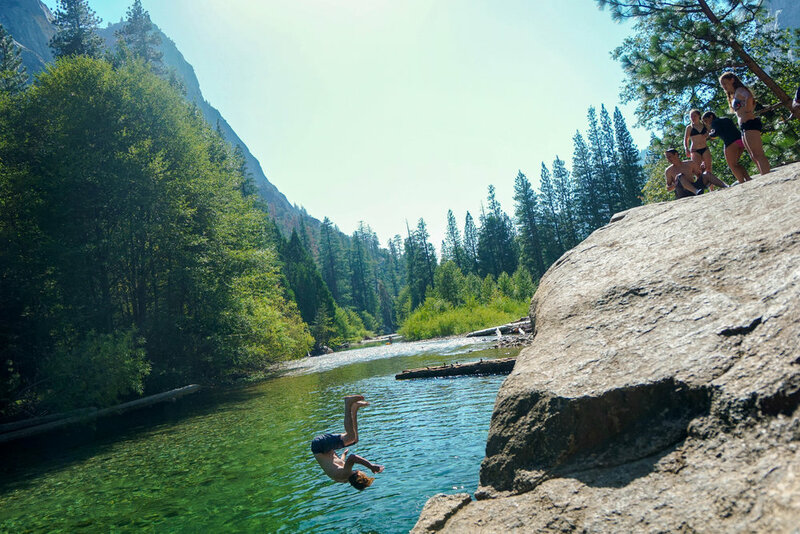 Nothing says summer like leap into ice cold Sierra Mountain water from a rock the legendary John Muir himself once sat upon! Pssht, Cosmonaut to Earth: We have lift off. With pure stoke Sawyer tries to convince his brother throw a flip into the river below. Shiloh isn't buying. Sawyer's not so smooth landing on his next jump might have had something to do with that. Gainer gone wrong. One last jump. 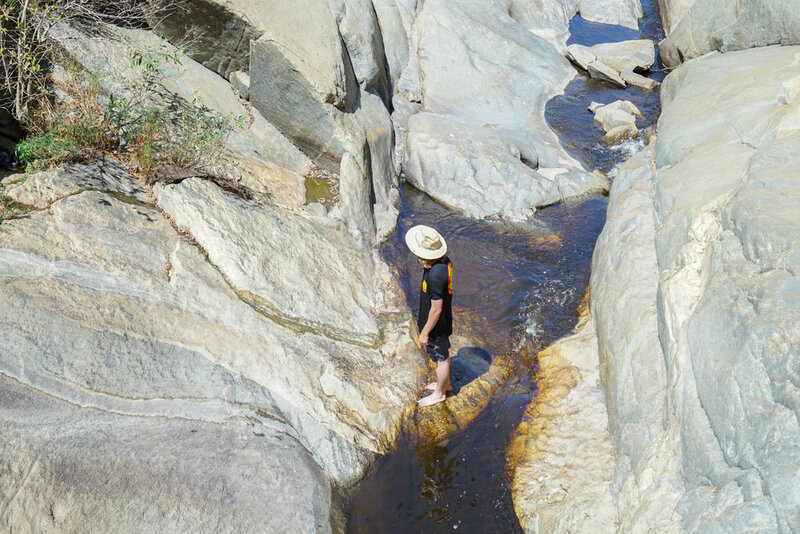 Hours of swimming in the cool water brings an unparalleled sanction from the warm summer sun, but now its time for us to get hikin'. Away from the river we feel the full force of the sun as it glares above a cloudless sky. Well that's one way to escape the heat. 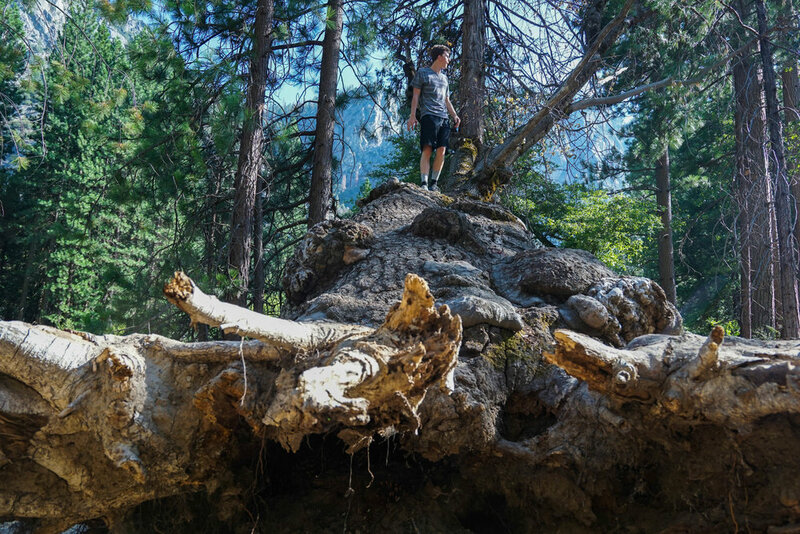 Forest fires frequently sweep through these forests leaving behind burn scars & human-sized caverns, but the mighty Giant Sequoia is nearly impossible to kill. When they do fall, its usually due to their shallow root system & prolonged drought. 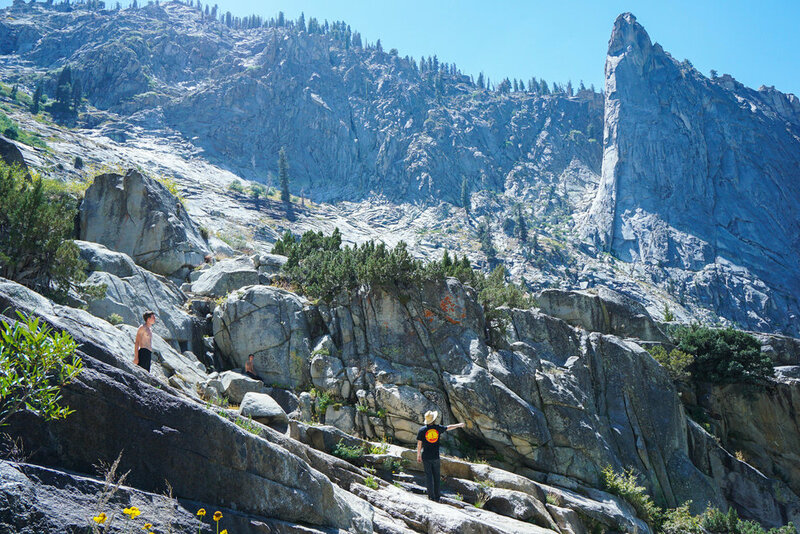 Since this area of the Sierras is only accessible 5 months out of the year we always try to relish every moment here. 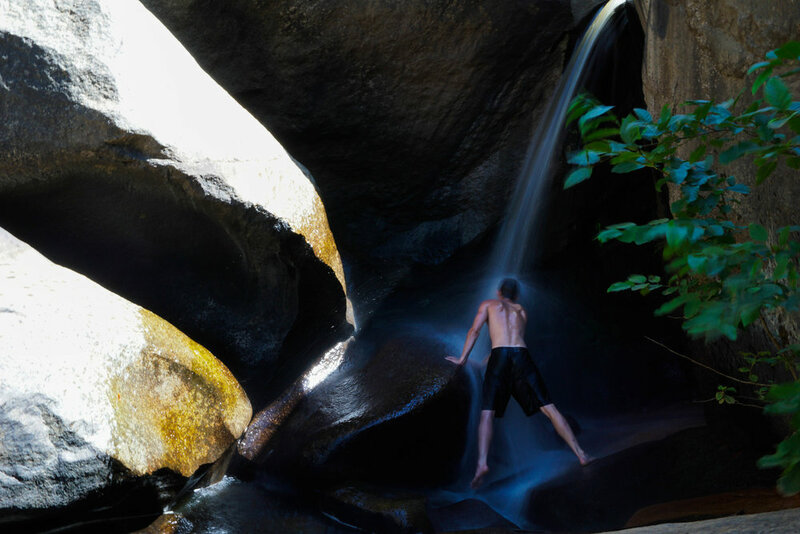 Toppled boulders of granite create hidden caves that not only provide new places to explore, but also shade! 90 degrees outside, 60 inside. Alas we reach the meadows! Its views like this that make an entire trip. Views like this aren't so bad either. It isn't until we self-eject out of our comfort zones that we reach of highest pinnacle. Priceless moments like this don't come from sitting on the couch, so get up & go. Yes you! Explore! A sea of grass. We're pretty damn lucky in this country to have so much public land preserved to explore. Hard not to love the access we have to wild places like this. There are even wheel-chair accessible trails. I think its safe to say, we've reached the day where there is literally no excuse not to explore. Enough sun. Time for some waterfalls. And believe it or not, this spot is only a 5 minute walk from the road. How cool is that? Thank you tax payer dollars. 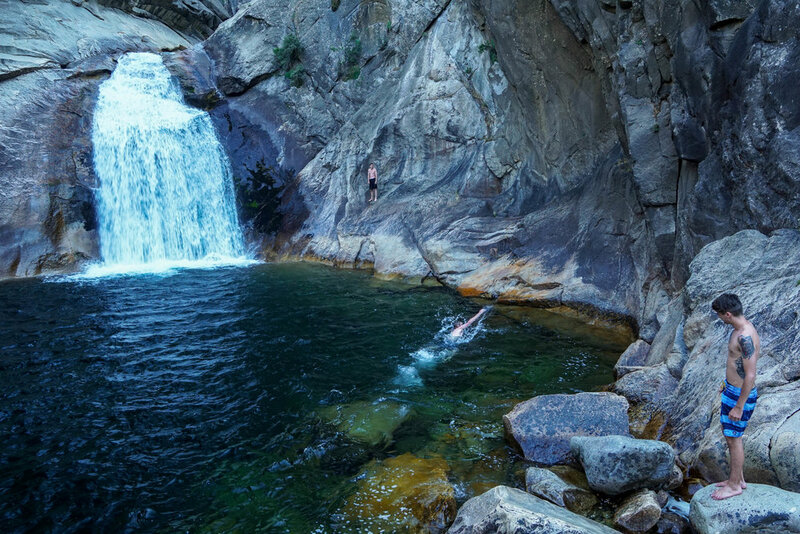 A trip to the falls wouldn't be complete without a cliff jump. To wrap the day up, the crew heads to one of our all time favorite places to watch the sunset. Can you see why? We even made a few extra friends. Bandit Camp. In places as wild as this, its easy to feel like you've been transported back to the days of the Wild West. Yee-haw! Mornin' Cowboy. Guess this is what happens when you don't fully rotate a gainer. We reach a clearing & near yet another waterfall. Or more like a trickle than a waterfall. 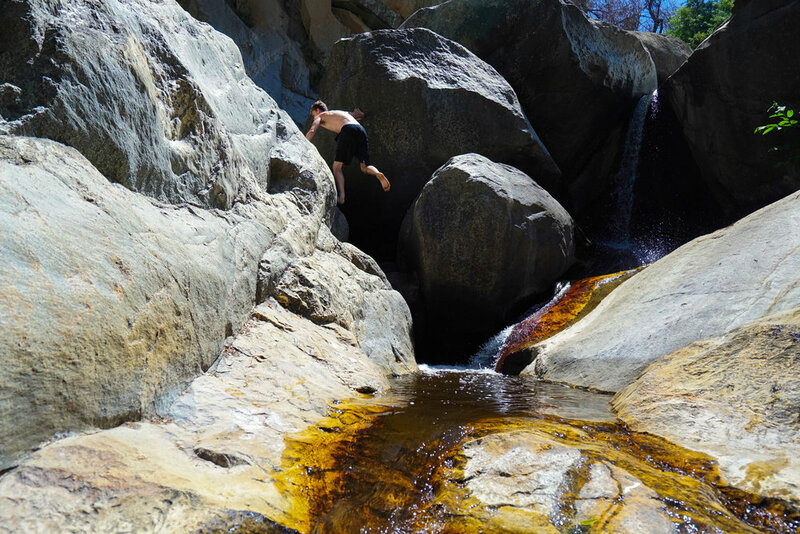 For the daring, once at the base of the falls, the real hike (or climb) begins. 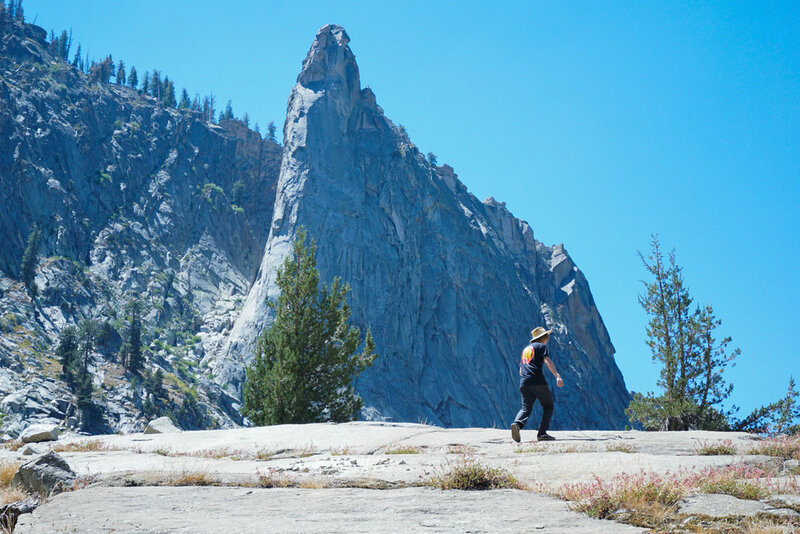 The climb quickly gains elevation & suns begins to beat down, radiating heat from the sleek granite. 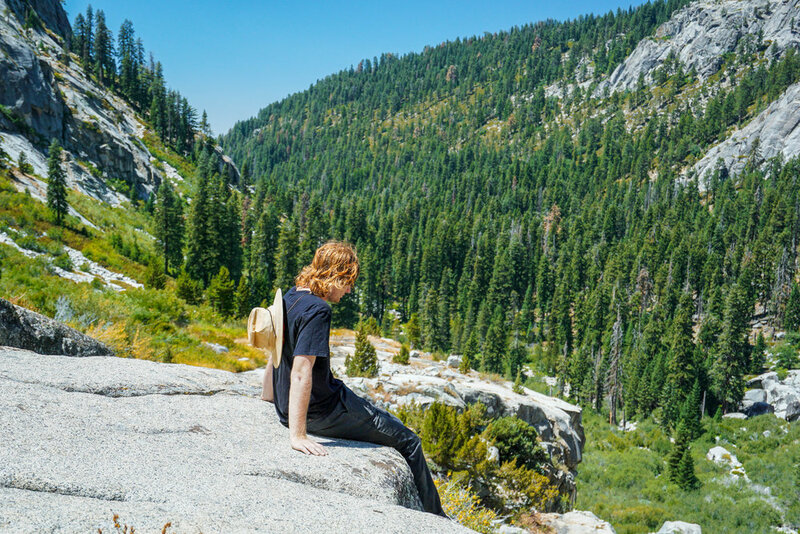 Here Sawyer takes in the view mid-hike under the cloak of some rare shade. 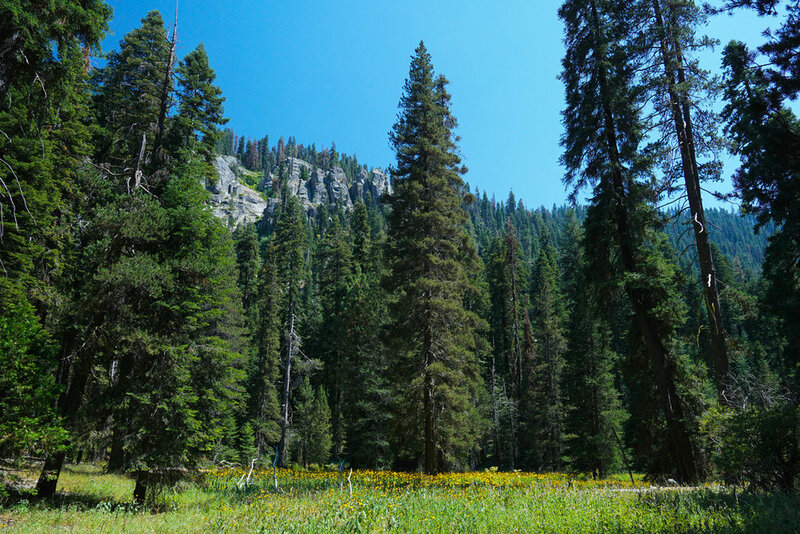 One of the awesome things about the Sierra is that some of its best wildflower blooms take place even in late Summer. This is what being a Cosmonaut is all about: venturing into the unknown in search of discovery. The best moments take place when we truly put ourselves out there. When it comes to a misadventure, the only one's we regret are the one's we didn't take. 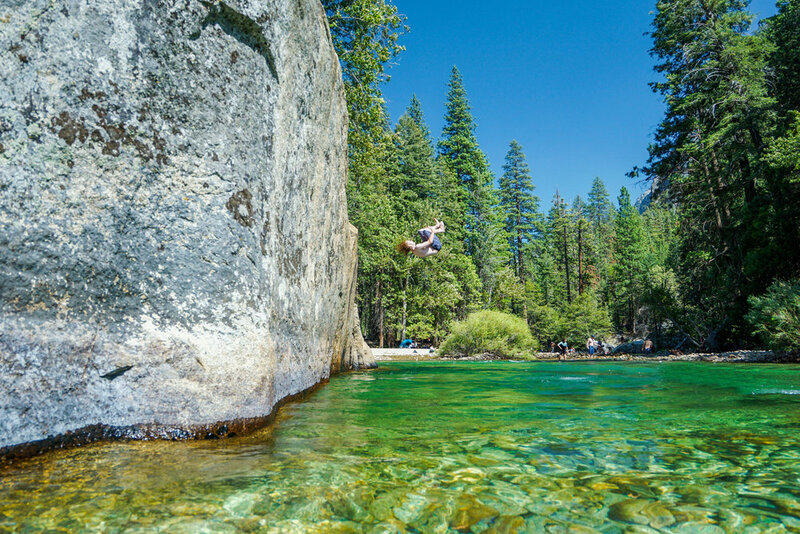 During early spring water from the falls roars over this cliff, but by late summer its the perfect perch to soak up the magic of the Sierras. 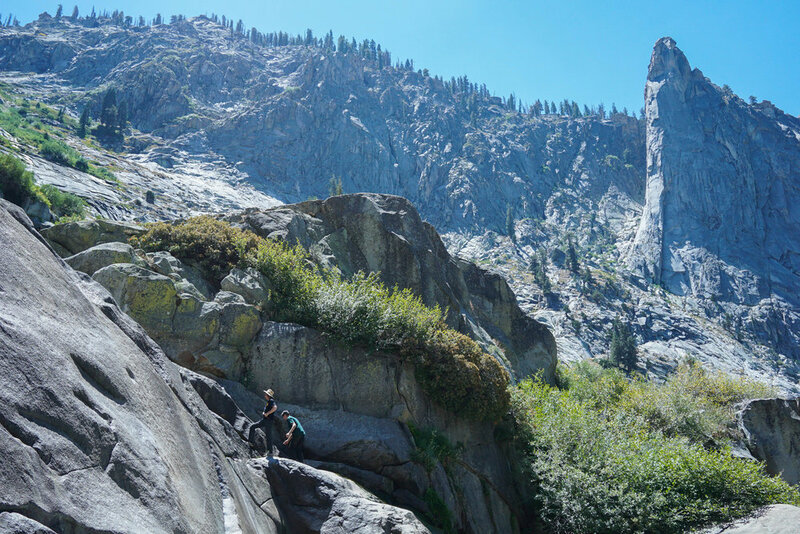 With the heat melting our brains, we route a new course back down the hundreds of feet of granite we climbed to get here. Cannonball! 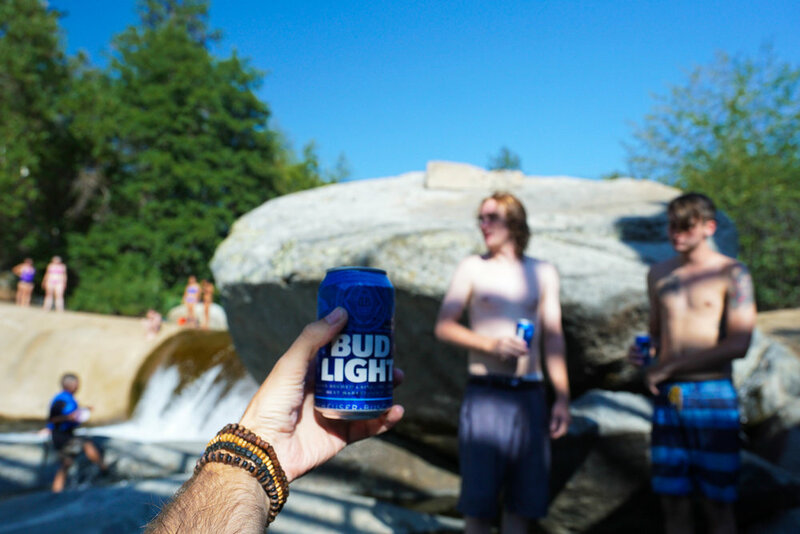 After a full day of hiking, nothing is more refreshing. Helped a couple dudes carry their cooler & ended up with some free brew for the crew. Score! 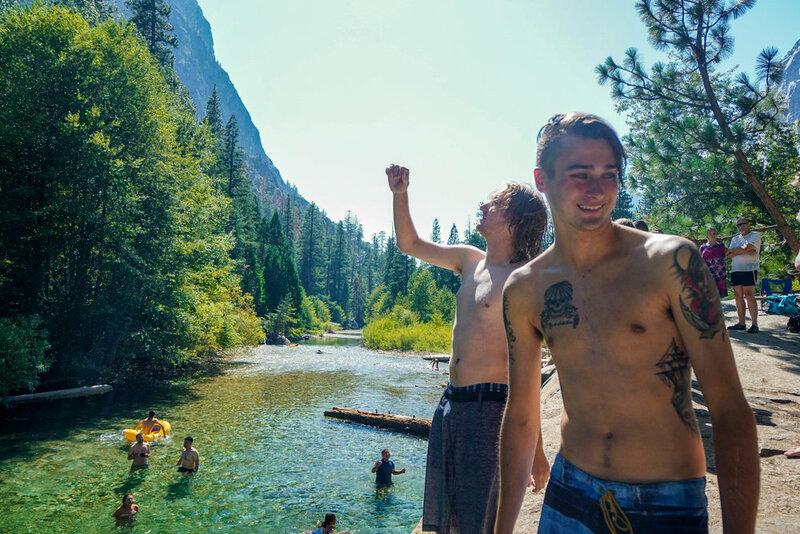 After hearing a rumor about a secret waterfall hangout we venture deep into the canyon following a vague set of mental directions. Climbing up a narrow channel peirced by a small stream, we continue on further in hopes of finding the secret spot. More water, but unfortunately still no falls. Alas we find a small cascade, but we quickly realize we're not the secret spot that had been described to us. Not ones to quit, we venture on to see what surprise beauty this unknown canyon is hiding. Granite streaks color the walls along our climb. Waterfall! Just not the one we set out in search of. What was cool though is that this was only one of a series of 10-12 segmented cascades. Sometimes a wrong turn is the right place to be. With the crew growing tired & the weekend nearing its end, we take in the last views before our trek back home. Until next time explorers!